A gray whale calf feeds on its mother’s milk, which is 53% fat, compared to human milk at only 2%. Gray whales get their name from their slate gray coloration with gray and white patches on the skin. They are covered with abrasions, blotches, scars, and clusters of white barnacles and orange whale lice. Adult males average 45–46 ft (13.7–14m) in length with adult females being slightly larger. The average weight is 30–40 tons for both sexes. Gray whales have a streamlined body, and unlike humpback whales, no dorsal fin, which is a good way to differentiate gray whales from humpback whales. They do however have a prominent dorsal hump about two thirds of the way down their back, followed by a series of six to 12 knobs extending to the tail stock. The upper jaw is narrow and slightly arched, and there are two to four grooves on the throat which are about five feet (1.5 m) long. The flippers are gray, shorter, paddle-shaped, and pointed at the tips, which is another good distinguisher from a humpback whale which has disproportionately long, white flippers. The tail fluke is very broad at 10–12 feet (3–4 m) across, and deeply notched in the center. Gray whales reach sexual maturity at five to 11 years or when they reach 36-39 ft (11–12m) in length. Their life span is estimated to be 50–60 yrs. Aging of adult whales has proven to be difficult and studies on techniques for aging cetaceans are ongoing. Females have a 12–13 month gestation period, and give birth to a single calf every two or more years. Calves nurse for seven to eight months on milk that is 53% fat (human milk is 2% fat). At birth, calves average 15 ft (4.5m) in length and weigh about 1,100–1,500 lbs (500–680kg). Unlike other large whales, gray whales concentrate in shallow protected lagoons to have their young. The most famous of these is Scammon's Lagoon off the west coast of Baja, Mexico, named after the whaling captain who first discovered the calving areas. Baleen whales take their name from the fringed plates called baleen which hang downward on either side of the upper jaw. Gray whales have the coarsest baleen of all whales, with about 20 bristles per inch (7–8 per cm) as compared to over 100 per inch (42–50 per cm) in sei whales. There are 130–180 baleen plates that are off-white in color and measure about two to 10 inches (5–25cm) long on each side of the jaw. Gray whales are the only baleen whales that are mainly bottom feeders, getting their food by scraping the side of their head along the ocean floor and scooping up sediment. Small invertebrates are captured on the baleen, while sediment and other particles are expelled through the baleen fringes. They are often seen surfacing with mud streaming from their mouth. Oblong bowl-shaped pits, measuring about three feet by six feet (1 x 2 m) are left behind as a record of their feeding. Gray whales eat primarily amphipod crustaceans, and concentrations of 12,000 to 20,000 amphipods per square yard have been found in the southern Chukchi Sea and northern Bering Sea where the whales feed. Gray whales rarely feed while migrating or during the winters in the tropical waters; feeding occurs almost exclusively during the summers and animals live off of fat reserves while breeding. During feeding, each gray whale eats about 1.3 tons of food per day. Gray whales generally live in small groups of about three whales, although groups as large as 16 animals have been observed. While feeding, groups converge and hundreds of whales can be seen in the same area. Feeding dives to the bottom last from three to 15 minutes. They are generally slow swimmers, averaging three to five mph (5–8 km/hr) during migration but can reach speeds of 10–11 mph (16–17.5 km/hr) when in danger. Gray whales are noted for their protective behavior toward their calves. They were called “devil-fish” by Yankee whalers, and Eskimo hunters are wary of them because they sometimes attack boats when their calves are threatened. Gray whales sometimes breach or spy hop, particularly during migration and breeding. During breaching, the whales leap partially out of the water and re-enter on their backs or sides with a large splash which can often be seen several miles away. When spy hopping, the whales raise only their heads out of the water, then slip back below the surface. Breaching is thought to be associated with breeding. The purpose of spy hopping is unknown, although some have suggested that the whales are looking for landmarks along the shoreline. Two Pacific Ocean populations of gray whales exist: the western Pacific stock, with a migratory route that is unknown, but presumed to be between the Sea of Okhotsk and southern Korea; and the eastern Pacific stock that travels from the Bering, Chukchi and Beaufort Seas to the southern Gulf of California and Baja. Also, a few individuals remain year-round off the coast of California or in Straits of Juan De Fuca between the state of Washington and Vancouver Island. Gray whales migrate 5,000–7,000 miles (8,050–11,275 km) each way. The eastern Pacific stock begins migrating north from late February to May, staying close to the coast from California to Alaska. They enter the Bering Sea, primarily through Unimak Pass, mostly in April and May, and continue moving along the coast of Bristol Bay. After passing Nunivak Island, they head toward St. Lawrence Island, arriving there in May or June. The whales disperse to spend the summer feeding in shallow waters (usually less than 200 feet (60 m) deep) of the northern and western Bering Sea and the Chukchi Sea. 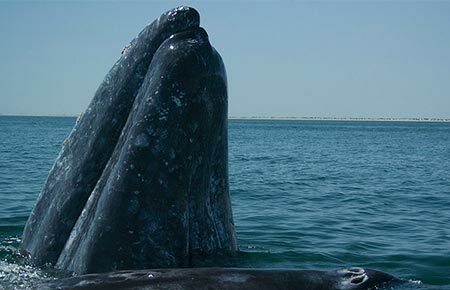 Gray whales begin their southward migration in mid-October, passing through Unimak Pass between late October and early January, arriving in Baja California, Mexico in December and January. Throughout the winter of 2003–2004, gray whale calls were recorded in deep waters near Barrow, Alaska. Researchers attributed their presence in summer feeding grounds during that particular winter to a combination of the increasing population size, habitat alteration associated with sea ice reduction, and warming in the Alaskan arctic. ESA: Listed under U.S. Endangered Species Act as Endangered except the population in the eastern North Pacific (including coastal areas and Bering, Beaufort, and Chukchi seas) which were delisted on June 16, 1994 (Federal Register 59:31094). Atlantic populations are extinct. At one time there were three gray whale populations: a north Atlantic population, now extinct; a Korean or western Pacific stock now very depleted; and the eastern Pacific population, the largest surviving population. The north Atlantic stock is thought to have become extinct in the 17th century. In the north Pacific, gray whales had been hunted to the edge of extinction in the 1850's after the discovery of the calving lagoons, and again in the early 1900's with the introduction of floating factories. The gray whale was given partial protection in 1937, and full protection in 1947 by the International Whaling Commission. Since that time the eastern north Pacific gray whale population has made a remarkable recovery and now numbers approximately 26,000, probably close to their original population size. The western Pacific stock was listed as endangered under the Endangered Species Conservation Act of 1970 and currently is estimated to contain only 101 individuals. The eastern Pacific stock was originally included in this listing, but was removed in 1994. Both stocks are listed as depleted under the Marine Mammal Protection Act of 1972. The only major predators of gray whales are killer whales and humans. Many gray whales have healed scars and killer whale teeth marks on their flukes and flippers. 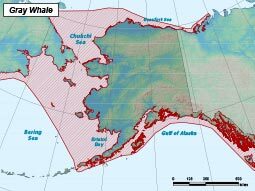 Early whalers and Eskimos from coastal Alaskan villages have reported many instances of gray whales fleeing into very shallow water and sometimes beaching or stranding themselves while trying to escape pursuing killer whales. During 1999 and 2000 a disproportionately large number of gray whales stranded along the west coast of North America; factors causing these events were not determined. In the 1800s and early 1900s gray whales were heavily hunted and it is estimated that by the 1930s only a few hundred to a few thousand remained. Currently, whaling is strictly regulated by the International Whaling Commission, with only small numbers being allowed to be taken for aboriginal subsistence purposes; 140 animals per year are allowed to be harvested from the eastern Pacific stock. Alaska Eskimos have harvested an average of two gray whales annually (range 0–6) in recent years. The western Pacific stock, with a migratory route presumed to be between the Sea of Okhotsk and southern Korea; and the eastern Pacific stock that travels from the Bering, Chukchi and Beaufort Seas to the southern Gulf of California and Baja. Females have a 12–13 month gestation period, and give birth to a single calf every 2 or more years.